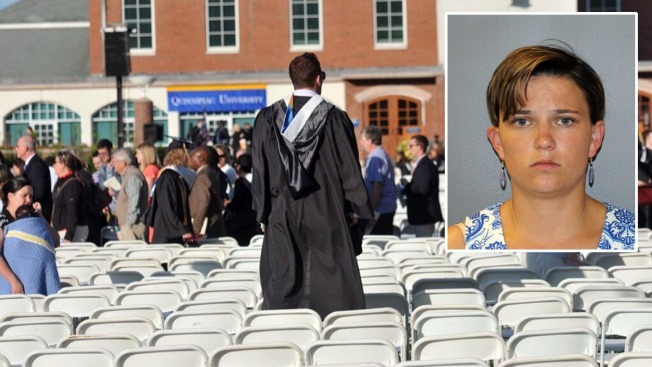 Police say they arrested an ex-Quinnipiac University student who allegedly admitted to calling in a pair of bomb threats in an attempt to get the Connecticut college's commencement ceremony canceled because she didn't want her family to know she had dropped out and wouldn't be graduating. Danielle Shea, 22, was arrested in a cap and gown after the threats forced school officials to move the school’s College of Arts and Sciences graduation from the campus’s quad to its sports arena Sunday, according to Hamden police. Police say Shea allegedly admitted to calling in the threats less than half an hour before the commencement ceremonies were slated to begin because she didn’t enroll in class that fall and didn’t want her mother, who had given her thousands of dollars for her education, to find out she wasn’t graduating. She told police she bought a cap and gown to attend the ceremonies, but panicked when her relatives didn’t see her name on the graduation roster. Quinnipiac public safety officers got the first threat at 5:38 p.m., about 20 minutes before the graduation’s 6 p.m. start time. In the call, the suspect said, "Bomb in the library." About 17 minutes after the initial call and while police were searching the library, the suspect called again and said, "Several bombs are on campus. You haven't cleared out graduation. That's not a good idea." Officers traced the calls back to a phone belonging to Shea, and the 22-year-old was taken into custody at the basketball arena. Shea is charged with first-degree threatening and falsely reporting an incident and is being held on a $20,000 bond. It’s not clear if she has an attorney. Quinnipiac officials say that 388 students and thousands of others were moved to the basketball arena as a precaution. The graduation was pushed back about an hour and a half.